Whether you are a beginner or an expert, some longboards can allure you with their virtuosity. And, the Volador Freeride Longboard is definitely one of them. Today you are going to read our complete Volador Longboard Reviews. If you want to cruise through crowds, take sharp turns and go a long way without any transportation cost, this is the one for you. Our Volador Longboard Reviews will take you through the features of the freeride model to help you have a better idea of the product. Moreover, we will not only tell you why you should buy it but also why you shouldn’t. Let us keep the environment safe and our expenditures low by using these marvelous longboards. With a length of 42 inches, the Freeride longboard may be considered a bit long for small people but that does not stop it from being easy to control. Because of its sturdy and clever build and also lightweight. It weighs only 8.4 pounds making it easy for you to carry on your hand and also glide it through the streets. This is probably the most important part of a longboard. So, you already know how long it is but what is it made of? You will feel relieved to know that the deck will provide you with everything you could want with its robust Multi-Ply Hardwood Maple construction. The material makes it both durable and very efficient in its purpose. It will skillfully make you feel balanced. The lightweight will help you move easily without applying much effort and the deck will make you feel that you have a complete grip on it. Volador knows what a crowded street can be like. People stop cars in their tracks to keep walking and when you are on a longboard, you are close to nothing. In this cases, what will help you is your wheel’s trunks. You have to take turns quickly and sharply. The trunks of the wheels should be very flexible and ready for this. And, Freerides trunks are. They have a length of 7 inches which gives them enough space to be flexible. Moreover, the aluminum construction makes them trustworthy for sudden turns. You can avoid accidents easily with these high-functioning trunks. As for the wheels itself, who wouldn’t want to not feel the bumps the road provides? The wheels are very smooth and they are capable of both handling these bumps and also going long distances without rest. With a diameter of 70 mm, they will hold the bumps away from you as much as possible. Now, if you are one enthusiastic rider who does not like to go slow, this longboard is still the one for you! Because of the Genuine ABEC & speed bearings of course. They are strong and efficient little tools to make your rides speedy with precision. Even if the looks don’t concern you, Volador gives you plenty to choose from. Since you are buying this spending your precious money, it’s best to choose whichever you like best from the collection of different colors like- Lemonade, Oriental Cherry, Purple Spade, Pine Green and Leaf Green. If you are a bit more concerned about the looks, good news! You can opt for unique designs to sit on your deck. Volador wants to fulfill every aspect of the customers’ demands in this way. Even the under-part looks great with the smooth wheels, matte black trunks and a great under-deck color combination with prints. If a downhill ride is always on your list, Freeride should be too. In fact, it keeps this speedy, peaky rides safe with its great features. It’s also great for daily rides and treads to places. In addition, it will do fine on depressed roads. Let’s watch a video review: Beautiful Board, Beautiful Ride! 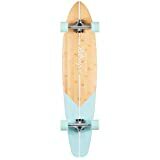 A great longboard for rides downhill, cruises to daily stops and also rides through depressed streets. Durable, sturdy and also lightweight maple wood deck. Efficient, flexible, strong trunks which allow sharp and swift turns. Comes in different colors and looks great with unique designs. Extremely stable itself and also provides ride with stability by absorbing shocks. Environment caring as it uses as less harmful material as possible and prohibits the use of methanol. The Lathed Pivot saves money and improves performance. The base plate has an angle of 40 degrees whereas standard downhill boards have 450-degree angles. Some longboards do break easily. How much weight can Volador Longboard carry? Answer: This longboard has the capability to carry 250 pounds maximum. 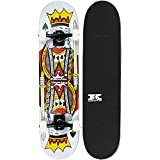 Is it a good longboard for tricks? Answer: Unfortunately, no, it’s not. It is great for speedy downhill rides and general turns and stops. However, it lacks the special features to support tricks. It will break easily and cause accidents. Therefore, it’s best used for simple rides that may belong as well. Can kids of age 5 use this? Answer: Yes, they can and easily too. The average sized kids will face no problem at all cruising this longboard with their small feet body. Because it’s designed specifically for every size of people and for easy control for any of them. 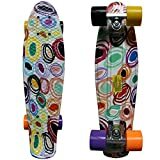 So, if a quality-constructed, durable and adept longboard that has a lot of worth at an affordable price, this should be something you check out. However, if you are into the thrills of twists, turn, flips and other tricks, this will not be a good one for you. Because it’s a great downhill board for speedy, manageable, and balanced rides. Though it takes turns quite well but not the ones that tricks require. So, you know better which style you prefer and what you are using the board for. Now, your decision should be easy and confusion cleared through this Volador Longboard review of ours. However, even though this was the review for a usual Freeride longboard, it’s not unlike that you will receive a faulty product. Therefore, check carefully while buying and opening. We are done here, goodbye!